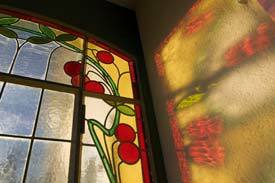 ABOVE: Art Nouveau architectural details are everywhere in La Chaux-de-Fonds. INSET BELOW: La Maison Blanche by Le Corbusier, and a clock of the Ebel watchmaking company. La Chaux-de-Fonds isn't the most obvious of Swiss tourist destinations: It doesn't have a medieval center, a lake, alpine ski slopes, or chalets in the middle of town. But if you're interested in architecture or 19th Century urban design, La Chaux-de-Fonds deserves a place on your Swiss travel itinerary. With 37,000 inhabitants, La Chaux-de-Fonds is the third-largest city of Suisse Romande (a.k.a. French-speaking Switzerland). In the 1700s, it became a world center of the watchmaking industry, and the town's prosperity--combined with the education and enlightened attitudes of its French Huguenot and Jewish settlers--led to a golden era of culture and architecture in the 19th and early 20th Centuries. Today, La Chaux-de-Fonds remains a livable city of hidden treasures and public pleasures--and one that's easy to reach, thanks to twice-hourly train service from Biel/Bienne on the main railroad line between Zürich, Neuchâtel, and Lausanne.